If you're a Shelby fan, you may know that Ford Mustang Shelby Cobra GT500 was the first Mustang to carry the famous "Cobra" name. While there have been other Shelby GT500 vehicles, the use of the Cobra name and Logo have been "loaned" (licensed) to Ford by Shelby America and used on several vehicles. Officially, the first Ford Mustang Shelby Cobra GT500 was a 1968 model. And it looked like it might be the last one. While there were other Mustang Cobras over the years, including the less than spectacular Mustang ll models and the much more impressive SVT Cobra pony cars, fresh from the engineers in the Special Vehicle Technology department, the GT500 disappeared until 2007. 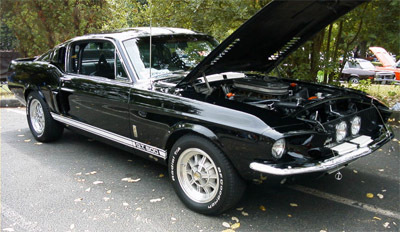 The First Shelby GT500 made its appearance a a 1967 model and boasted a big and powerful 428 cubic inch V8 engine, producing an underrated 355 horsepower and 420 pounds of big block torque. To set it apart from the regular Mustang, Shelby crafted a unique styling package or body kit including a powerful looking hood with functional hood scoops, new fiberglass front nose, fiberglass side scoops and rear fender extensions melding into an up swept rear spoiler. Click the link for more 1967 Shelby information . The 1968 GT500 boasted a styling update and a new assembler. While the originals began life in Los Angeles, the new 1968 models were relocated a little closer to Ford's home at the A.O. Smith Company's Michigan assembly plant. 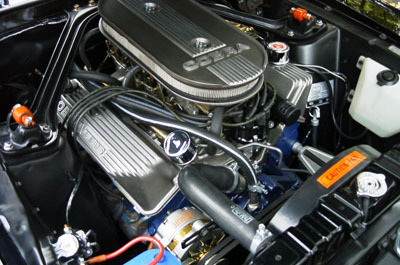 The two main highlights of the 1968 model year were a powerplant change to the vaunted 428 Cobra Jet found in the 1968 GT500KR or King of the Road and a very rare option, a 400 horsepower 427 cubic inch engine. 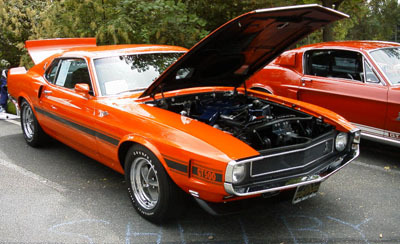 The 1969 Ford Mustang Shelby Cobra GT500, along with the new '69 Mustang, brought major styling changes. Shelby's version, extended both ends of the vehicle, making it longer and more serious. And in my opinion, it also has interesting parallels to the styling of the next major restyle of the Mustang for the 1971 models. The 1970 Model, signaled the last year of the Ford Mustang Shelby Cobra GT500 until some 37 years later. The year 2007 marked the 40th anniversary and return of the Ford Mustang Shelby Cobra GT500. The 2007 Mustang GT500 is built on the 1960's and 70's styling cues of the new Mustang which debuted as a 2005 model and the folks at Shelby worked their magic. Naturally, the muscular pony car couldn't just have any engine, even though the 2007 Mustang GT engine produced a very respectable 300 horsepower. The combined talents of Ford's SVT department and Shelby engineers resulted in a supercharged V8 engine, cranking out some 500 horsepower and transferred it to the pavement with a slick Tremec six speed transmission. Caroll Shelby, never a man to sit on his laurels, told his engineers that he wanted something even better than the "standard" Ford Mustang Shelby Cobra GT500. A car so good, that it would blow the doors off anything out there. 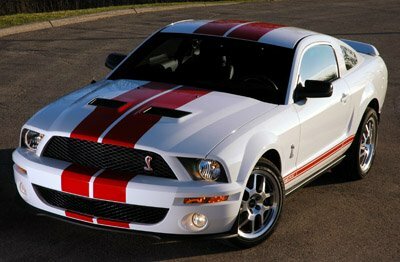 What developed, was the venomous 2007 GT500 Super Snake , a limited edition, enhanced car that produced 600 - 750 horsepower, depending on whether a warranty was important to you. 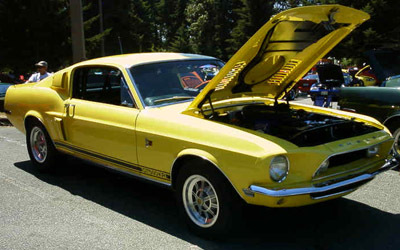 ( 750 hp = no warranty) The amazing fastback Mustang featured a heavy assortment of Ford Racing parts, improving handling, braking,cooling, while adding distinctive styling to further set it apart from the pack. But probably the crown achievement for the 2009 model was the awesome 2009 GT500KR king of the road. With a 5.4 liter supercharged engine pumping out 540 horsepower, it was truly an American Supercar. The , 2008 GT500 Super Snake was actually, a carryover 2007 Shelby, but considering the performance and handling of this amazing package, the fact that little could be done to improve the beast, says a lot about just how good this car really is. It's amazing, just how far the venerable small block Ford V8 has come. With the introduction of the Ford Coyote engine, an all new 5.0 liter V8 boasting a factory stock 412 horsepower. But if you're name is Shelby, that's just not good enough. While a 5.0 liter V8 is "sufficient" for the basic Ford Mustang, the Shelby has had the larger and more potent 5.4 liter V8, capable of producing more gut wrenching torque and high horsepower output. 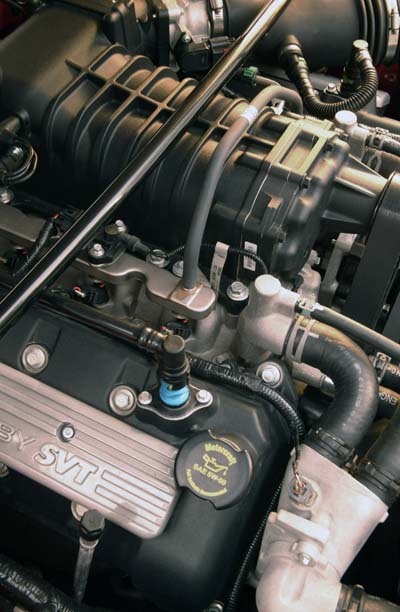 Not fettered by a need for modesty, the Ford SVT team and Shelby engineers, created an all aluminum 5.4 version of the cast iron engine, featuring new Plasma TRansferred Wire Arc technology cylinder lining. Instead of sleeving, this system coats the cylinder walls with a tough durable surface that reduces weight and reduces friction. The resulting improvements, push horsepower up to 550 and torque up to a big block territory 510 lbs. With improvements in braking, suspension and tune, these pony cars bear little resemblance to Ford's secretary's car. 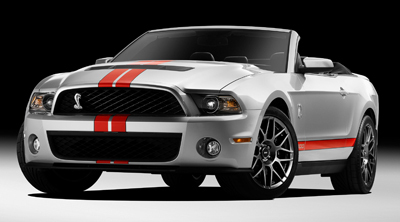 The 2010 and 2011 Ford Shelby GT500 continue the legacy and improve the breed in the process. With improvements in braking, suspension and tune, these pony cars bear little resemblance to Ford's secretary's car.